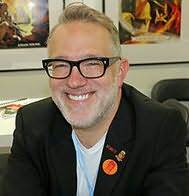 Tony DiTerlizzi is an American fantasy artist, children's book creator, and motion picture producer. DiTerlizzi created The Spiderwick Chronicles series with Holly Black, and was an executive producer on the 2008 film adaptation of the series. He won a Caldecott Honor Medal for his adaptation of The Spider and the Fly. In the gaming industry, he best known for his work in the collectible card game Magic: The Gathering and on the Planescape product line for the Dungeons & Dragons role-playing game.DiTerlizzi lives and works in western Massachusetts with his wife and manager Angela DiTerlizzi, their daughter, and their pug, Goblin.